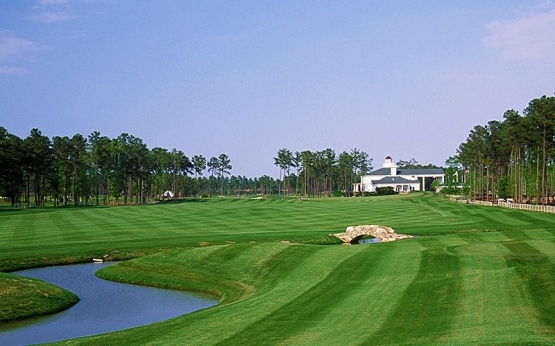 International World Tour Golf Links is a Myrtle Beach golf course that everyone should experience. Designed with the intent of giving every golfer the opportunity to virtually take a trip around the world and play some of the most recognized holes in the world. The experience begins as you drive up the magnolia-lined driveway to a 25,000 square foot antebellum clubhouse. The service that you will receive at World Tour is second to none. A beautiful practice facility is available so that you will be prepared to take on this unique golf experience. The Open Nine features holes from The Open Championship and U.S Open Championship venues while the Championship Nine features holes that are inspired by all four Men’s major championships, The Open Championship, U.S. Open, Masters and PGA Championship. You can’ help but feel a sense of history as you play on holes from legendary courses such as Oakmont, Augusta National, Pine Valley, St. Andrews, Royal Troon, Colonial and Winged Foot. As would be expected the International World Tour Golf Links is always in immaculate condition and the lush fairways that lead to beautiful smooth greens. The International World Tour Golf Links is part of Founders Group International. There couldn’t possibly be a better Myrtle Beach golf course to add to your Myrtle Beach golf package than International World Tour Golf Links. A Myrtle Beach Golf Authority golf package can include this course with any of the other Myrtle Beach championship golf courses. The stress is taken away as they will build the ideal package that will include the finest in Myrtle Beach and North Myrtle Beach accommodations. After your round of golf be sure to check out some of the Myrtle Beach nightlife that features places such as 2001, Broadway at the Beach, Barefoot Landing, Ducks Beach Club and the Spanish Galleon. All of the wonderful Myrtle Beach golf and Myrtle Beach entertainment is just waiting for you! Very nice golf course. Greens were quick and the course layout was very fun to play. Beautiful clubhouse and great bartenders. I would of given a 5 but the course workers were very pushy and a ranger picked up my ball and put it in his pocket. I highly recommend this course.